In July, Craftsy launched Blueprint. It is actually spelled “Bluprint” and can be found at Mybluprint.com if you are having trouble finding it. I’ve used Craftsy for years and have always felt they have some of the best arts and crafts educational content out there. I wondered, would Blueprint (Bluprint) be as good? Can I really get as many $60 classes as I want for about $15 a month? Would the value be as good as Craftsy? I’ve been using Blueprint/Bluprint for several months now and It is NOT what you would expect. Bluprint is a bigger idea than Craftsy was. It still has all of the amazing educational content, independent pattern designs, and craft supplies shop. But Bluprint is aiming to serve its audience in a deeper and more meaningful way. Let me explain. A lot of us who are interested in Arts and Crafts also have other similar interests in life. I suspect a lot of us struggle with the same things. We watch the same kinds of shows to unwind – sometimes inspirational, sometimes educational, and sometimes guilty-pleasure reality TV. A few months ago, I saw a product placement for Craftsy/MyBlueprint in one of my favorite guilty pleasure reality shows, Southern Charm. Southern Charm is on Bravo. Bravo is owned by NBC Universal. And guess what…so is Craftsy! NBC and the team at Craftsy/Bluprint have figured out that we don’t just watch classes. We want to learn skills, but we also crave inspiration and the ability to totally unplug from our lives for 30 minutes. We are working on our health, our families, getting better at running our homes, and a million other things. They are creating new shows and content to enhance our lives in a more meaningful way than just a craft class. My Blueprint is an epic experiment in content development and delivery. And so far, I couldn’t be happier with it! 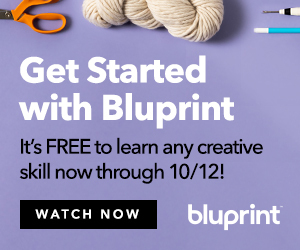 When Blueprint originally launched as Craftsy Unlimited I was THRILLED that I could access all of those crafty classes on my wishlist whenever I have the whim. And rather than it costing $60 a class – which I’ve gladly paid to learn to knit, crochet, and other basic skills, it is just $15 a month. Blueprint (MyBluprint.com) WAS still unlimited craft classes. But Blueprint also has really entertaining, creative shows and even fitness classes. Ballet and dance classes!? Yoga? Cooking! Kids classes! They also have content from The Great Classes to offer wellness education and other classes. This doesn’t just serve my crafty side, it enhances my whole life. My little education nerd heart is bursting. Suddenly, NBC aired this truly wonderful show called Making It, starring some of my (and probably your) favorite funny people, Nick Offerman and Amy Pohler. NBC Universal is obviously watching me at home on a Tuesday night in my mismatched cozy socks and Justin Bieber jammies. I always thought I might eventually write a review of creative online class platforms on this blog. I was going to compare CreativeLive, Craftsy, Creative Bug, Skillshare, etc. But now, comparing Craftsy/Blueprint to those other sites honestly doesn’t make sense anymore. Blueprint is more like a network that offers classes too, rather than a class platform. Blueprint is more like a TV network that offers classes too, rather than a class platform. I really like Blueprint so far. Here is what I hope Blueprint changes, and what they don’t change as they grow. Make this Blueprint content available on FireTV as an app. Both the shows and the classes. Redesign the web platform – articles are prioritized, but I want you just to tell me on that page what I want to watch. I don’t want to read an article – I’m in surfing mode. 🙂 I want to start watching stuff and then decide. More Community Events – How cool would it be if this platform could not only serve us, but connect us in real life! The independent online pattern stores – I’ve discovered so many amazing projects and bloggers on the platform. The long format, well-organized classes – Craftsy’s class platform is one of the best out there. I love that I can skip to different sections of a class when I need to review something or just watch the whole thing during pockets of time in my day and go back when I have time later without getting off track. The entertainment/inspirational content shouldn’t be delivered in the same way, but for the classes, it’s perfect as is! What do you think about Craftsy’s Bluprint? Are you feeling it? Share your opinions in the comments!